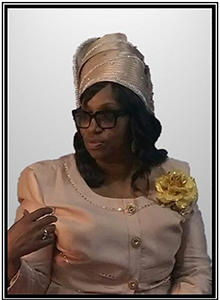 It is indeed a blessing and honor to introduce to you the ministry of Prophetess Shirley Ard, one who is called, chosen, and appointed for such a time as this. She is the fifth child, born December 30th, in Gulfport, Mississippi, to Bennie T. Benjamin Sr. and Frances Benjamin. Being raised in a certain denomination she was taught that God didn’t call or use women in certain positions of the church. In spite of her teaching and her personal belief in 1982, while in Baumholder, Germany under the leadership of now, Dr. Al­bert & Ester Green, the Lord saved and called her to be an Evangelist. In 1985, Prophetess Ard was struck with an incurable disease. She was told she was sick unto death but the Lord gave her a super natural deliver­ance. She then thought the worst thing that could happen have happened. In September 1987, at the young age of 28 years old, she was the mother of three. She was happily married to a Prophet of the Lord for 9 years in whom she was very dependent. Elect Lady Ard’s husband died and she became a widow. The very thing she feared the most had come upon her in one day. The spirit of fear began to dominant her life. She was afraid of the dead, living alone, driving a car, and public speaking. After several years, total deliverance came. By faith, she is preaching the word of deliverance to people far and near; teaching how God has brought her from sick­ness into health and from fear into faith; that the same God is able to do exceeding, abundantly, above all you can ask or think according to the power that worketh in you. Yet, submitting to the will of God and being faithful to the call, she is an anointed woman with purpose, integrity, wisdom, and love. Prophetess Shirley Ard does the work of an evangelist, teacher, pastor and prophetess. The gifts and the fruit of the spirit are in operation in her life. Her love for God and his people has caused her to persevere and fight the good fight of faith. She has by faith stepped out and become a trail blazer conquering uncharted lands of opposition. In 1992, she founded the True Deliverance Evangelistic Outreach Mission in Gulfport, Mississippi. Currently True Deliverance Outreach Ministries, Inc., where she has labored faithfully for 23 years and counting. As a gift to the body of Christ, Prophetess Ard is always willing and ready to share the Word of God with his people. Known as a Holiness preacher and student of the Word, she is currently attending North Carolina School of Theology/Hope Christian College where she received her Bachelor degree in Theology. Graduating June 2016 and now working on her masters.